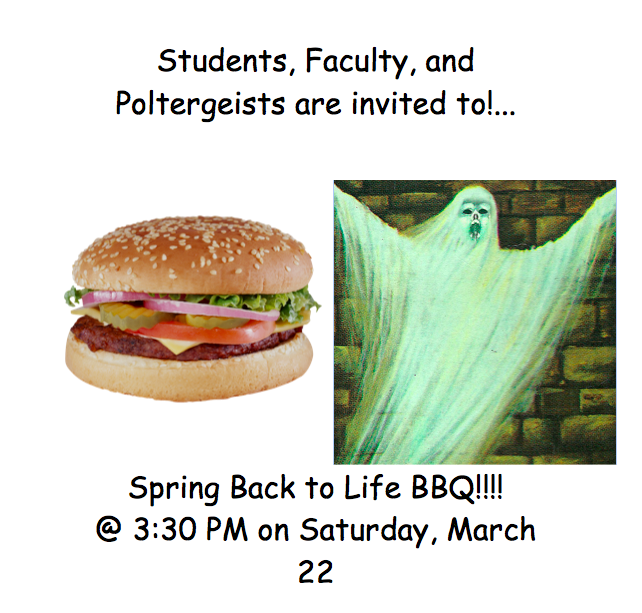 SAINT PETER—With an open invitation to all students, faculty, and poltergeists, the Rundstrom ghost is hosting the annual “Spring Back to Life Barbecue” outside of the Christ Chapel columbarium this Saturday at 3:30 pm. The ghost will begin flipping burgers in the new Christ Chapel Memorial Garden at 3 pm, with the ground beef coming from the ghost cow that haunts the top floor of Old Main. In case of rain, the event will be moved into the Rundstrom chapel where they will screen the 1990 Patrick Swayze and Demi Moore film Ghost. The ‘Spring Back to Life BBQ’ poster.